Vertical Carousels & Vertical Lift Modules Vertical carousel storage systems and vertical lifts fully utilize “the cube” — that otherwise wasted space in your warehouse or distribution center. Vertical carousel storage equipment often has an incredible return on investment because it can mean the difference between outgrowing your current space and optimizing your current space. Outsource Equipment can provide your business with the new or used vertical storage carousel and/or vertical lift module that best suits your operational needs. The basic design is simple: Vertical carousel storage systems consist of vertical rotating shelves that move up or down on response to your commands, delivering items to you at an ergonomically safe and convenient access window. 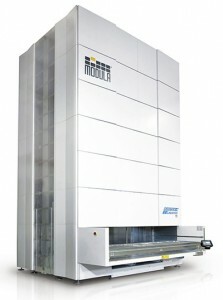 The VLM (Vertical Lift Module) is a compact automated storage and retrieval system. In the center is a platform equipped with an extraction mechanism operates in the vertical plane. The computer controlled platform transfers the special storage trays from the access window to an appropriate storage location. While the trays remain in the system, they are protected from the outside environment. Like their vertical counterparts, horizontal carousel systems consist of shelves that move on command and ergonomically deliver items to you, but in this case the shelving rotates on an oval track that is parallel to the floor. Horizontal carousel systems are also highly customizable – and adaptable to varying inventory demands. Two or more horizontal carousels easily can be arranged in a pod, with multiple orders lined up along the various carousels to optimize batch picking. Vertical equipment is ideal for general warehousing or central storage on a production floor. What’s more, vertical lift modules can play an indispensable part of your operation, offering increased: Flexibility – modular construction and intelligent controller technology. Economy – through over space optimization using minimal floor space. Productivity – innovative design improves cycle time puts operators at the helm of a highly efficient, fully ergonomic workstation. For more information on the advantages of vertical storage, read 7 Reasons to Get a Vertical Lift Module and this case study.